Carpets come in for some rough treatment. By far the best way to clean carpets is by using heavy duty carpet cleaning machines which use the process of hot water extraction. A technician uses a wand connected to an extraction machine and jets down a mixture of temperature-controlled hot water and carpet shampoo. This is then immediately sucked up via a vacuum slot on the wand. The soiled water is collected in a recovery tank and emptied periodically. Besides regular office carpet cleans we are always on hand to help with those little office mishaps. We understand that first impressions count in business so we provide emergency support for when those carpets need a rapid clean. 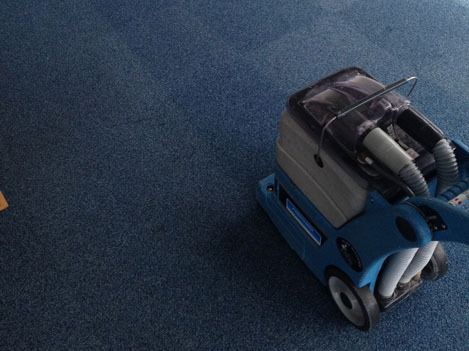 Ask us about the bespoke carpet cleaning support we can offer your business. Rest assured with New Penny Cleaning. All work undertaken by our fully trained cleaning technicians is fully insured. With over 20 years of experience New Penny Cleaning has the expertise and specialist tools to cover any cleaning requirement. Does the office furniture need cleared before the carpet is cleaned? How often should I clean my office carpets? This is dependent on the foot traffic and the number of staff in the organisation, but we recommend having carpets cleaned in communal areas at least twice annually as a minimum.